It either catapults your business into the future or it leaves you behind. Drive your Strategy with the only Business Insights Dedicated Exclusively to STEM Education. Prepare for product opportunities; understand product threats. Market Need: Over the next 3-5 years, which emerging technologies do you need to know about? The Horizon: What are the budget priorities of STEM educators? Maximize your Return on Marketing Budget. Outreach: When is the best time for sales visits? To send emails? 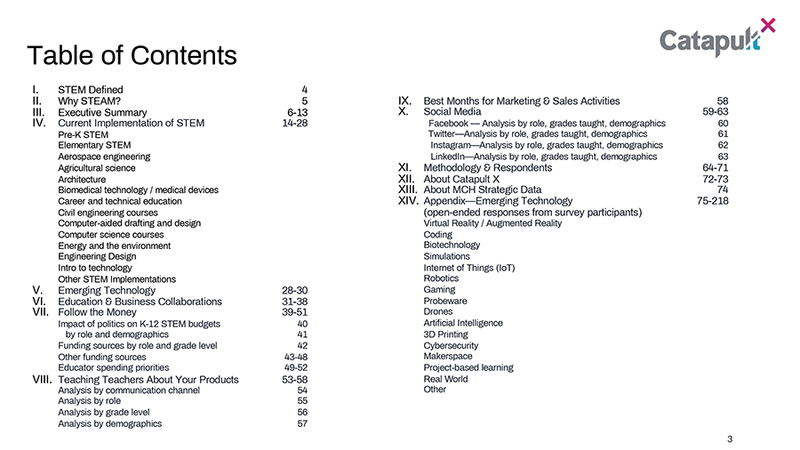 Print: When do STEM educators want to receive catalogs? 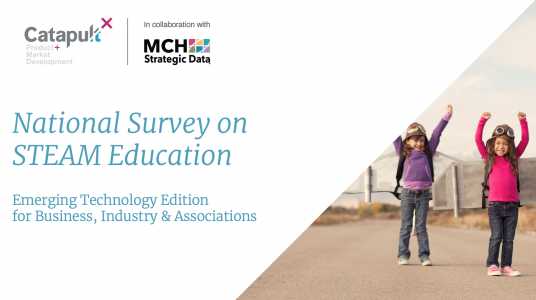 Download the Table of Contents from The National Survey on STEAM Education for free. Before fielding this survey to over 100,000 educators, we sent a test to 100 science and STEM educators for feedback. More than one educator asked us to include the arts, and we listened. STEAM also represents our field of respondents. MCH Strategic Data provides lists on educators who identify as STEM/STEAM. For simplicity, we used STEM throughout the report unless representing a direct quote. How is STEM defined in this research? We used the definition of STEM sent to us by Carol O’Donnell from the Smithsonian Science Education Research Center. The definition comes from Carnegie Mellon University. “ . . . an interdisciplinary approach to learning where rigorous academic concepts are coupled with real-world lessons as students apply science, technology, engineering and mathematics in contexts that make connections between school, community, work and the global enterprise enabling the development of STEM literacy and with it the ability to compete in the new economy” (Tsupros, Kohler, & Hallinen). * Respondents were given the option of more than one education level, and grade level. How was educator data obtained? MCH Strategic Data provided the list of STEM/STEAM educators to whom the survey was fielded via email.